The idealized representation of a modern woman of leisure captured during an introspective moment was a popular subject for American artists at the turn of the century. 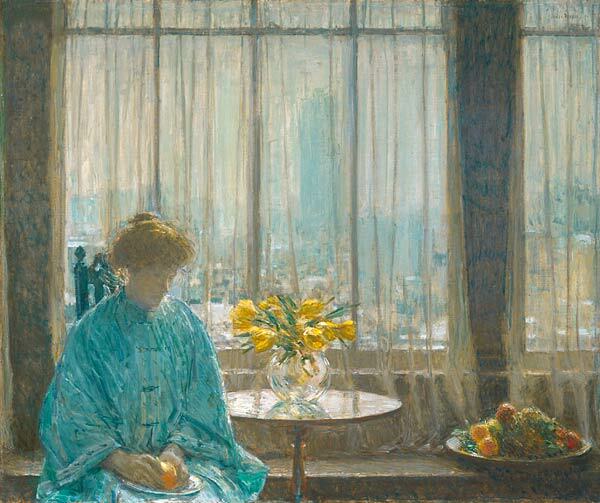 About 1910 Hassam, one of America's foremost Impressionists, began the "New York Window" series, a group of paintings depicting a contemplative woman seated before a curtained window. In The Breakfast Room the form of the faceless subject is one of several elements- including the seemingly mundane silhouette of the window, the vase of flowers, and the bowl of fruit- that the artist used to balance his asymmetrical composition. Clearly, Hassam delighted in differentiating the visual effects of light on various textures, such as the sheer curtain, the gossamer fabric of the sitter's dress, the reflective surface of the tabletop, and the sparkling transparency of the glass vase.